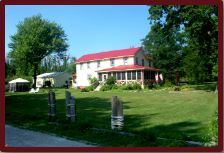 We want your stay on Pelee Island and The Wandering Pheasant Inn to be relaxing and comfortable by offering you a place with a few extras. Note: All booking are done by phone, e-mail for inquires only. In our historical 19th century home has a variety of themed rooms with vintage style decor. They all include one queen size or double bed, fresh clean linens; 4 full baths and 2 half baths to share. 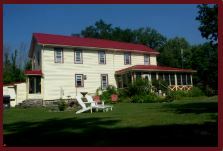 Birding special: May 1st to 15th stay two nights, get the third free; call for details. Suites – $175, per night (double occupancy). $35 per room per additional guests. Indulge in a modern Victorian suite with all the privacy you will need. These suites are situated at the back of the two and half acre property where you will find all the serenity you are looking for. All 4 suites include an orthopedic queen sized bed, fresh clean linens, a full bathroom with stand up shower, sitting area, bar fridge, a screened-in veranda with lounge chairs, and hammock. All rooms include complimentary baked goods and fruit each morning, includes coffee, tea, fresh baked muffins and fruit. This is a perfect place for large groups such as wedding parties, reunions, photography groups; art groups; ect. Sleeps up to 32 people. An exception for children is made only if the whole inn is rented by a party. No cancellations on four or more rooms booked for large parties, entire booking will be charged to the credit card provided. There are no exceptions unless agreed upon. Two week cancellation policy, non-refundable. Note: Entire booking will be charged to credit card if you do not cancel a whole entire two weeks before ferry departure time. This policy does not apply; “only” if the ferry does not run, no other exception will be considered.